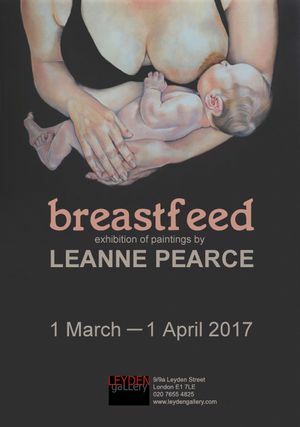 For the Whitechapel First Thursday of March, and to coincide with Leanne Pearce’s Breastfeeding exhibition, Desperate Artwives will stage a ‘takeover’ of Leyden Gallery, and present a curated programme of performances and interventions, all for free admission. The artists will perform and temporarily install work designed to challenge and excite the audience and consider the political and creative meanings central to domestic and maternal experience. Desperate Artwives insist on the importance and significance of the maternal and female voice within contemporary art and invite you to come along and experience how we manifest the feminist mantra,’ the personal is political’ in our work. Curators: Emy Dignam and Eti Wade. Amy Dignam is a visual artist who evolved as a mother-artist in 2012. Amy is the founder and curator of the Desperate Artwives project, co-founder of the Mother House. Her work was recently shown as part of the ‘Artist as Mother as Artist’ exhibition at the Lace Gallery in Nottingham and is included in ‘The Egg, The Womb, The Head And The Moon’ collective and exhibition at Artsmill, Hebden Bridge (2014). Desperate Artwives have exhibited at the Vibe Gallery (2012), Leroy House (2012), Barbican Arts Group Trust (2014), Crypt Gallery (2014) and at the Granby Space Lower Marsh (2017).